This is Part 2 of a 2-part blog post series. In Part 1 I talked about what I accomplished in 2018. Today I want to share my goals for 2019! If I have noticed anything regarding social media platforms in 2018 – from Facebook constantly being pursued because they sell private data, to Tumblr’s crackdown on NSFW content – I have noticed that social media platforms aren’t exactly held accountable. They’re also always changing. I want to have a space online dedicated for my art, sharing the art and stories of my life, and hearing from you, the reader. And the best place to do that is… this blog. So, in the spirit of sharing in spaces that are NOT social media platforms, I’m going to start updating this blog once a week in January. I want to start with once a week updates for two reasons: to not overwhelm myself, and because there’s a lot going on outside of the blog. There’s Validation, The Legend of Jamie Roberts, the projects detailed in the other goals for 2019, and now I have a new job outside of the internet. So, once a week updates it is… for the time being. Still, I want to share art, news, and stories, and I want to hear your stories, as well. Lazy Diana is a zine I make. 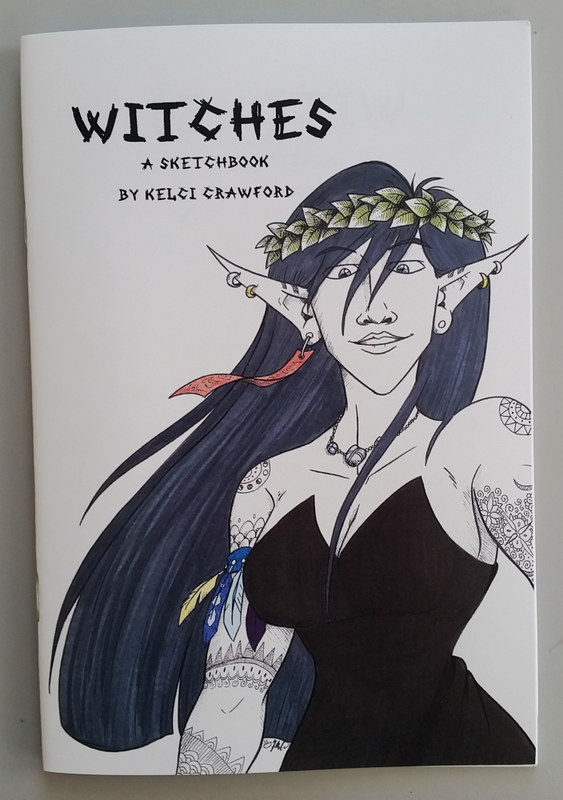 As I like to pitch it at conventions, it’s Magic and Paganism for lazy people. Because not all of us in the field can afford going to the top of a specific hill three days before the first quarter moon and stand under a yew tree. RAVEN. Lazy Diana: The Podcast will be very much about magic and paganism for lazy people. The plan is to have episodes last ten minutes or less, updating twice a week, with each season being about 16 episodes long. There will be a two-week break between seasons, to give me time to write and record new episodes, edit them, and all that jazz. For 2019, I want to actually make this podcast a reality! The plan is to have a website for it where people can download new episodes or listen to them on the site itself. I may pursue other platforms (like Apple Podcasts, Spotify, Castbox, etc), but… I’m not entirely sure how those work. More research will be needed there. This has been a goal of mine since 2017, when I started Beyond the Rainbow. Beyond the Rainbow is an LGBT advocacy group in my neck of the woods. Because up until Ohio Valley Pride became a thing, there was no LGBT advocacy group in my neck of the woods. I do still want to make the LGBT History podcast, for two reasons: a) it’s cool to read about LGBT figures in history, and b) the local radio station expressed an interest in airing it on their station. Their FM station. That broadcasts in the Wheeling, WV area. The mostly densely populated area in my neck of the woods. This project (and Lazy Diana) had been on hold because I needed a half-decent microphone to record at home. Now, thanks to a Christmas present from my little sister, I have one! The goal with this series is to update it once a week: this is to keep myself from being overloaded, and also because the radio station has only one time slot for this show to air. Episodes would be half an hour long, probably a little shorter to allow for advertising spots. Again, because that’s the length of time the radio station would allow. Have you noticed that there’s not a ton of indie comics coverage in the comics news hemisphere? It’s mostly Marvel, DC, Dark Horse, and the like. The most indie it gets is Image comics and the occasional coverage of a webcomic that’s managed to garner more than 3000 regular readers. 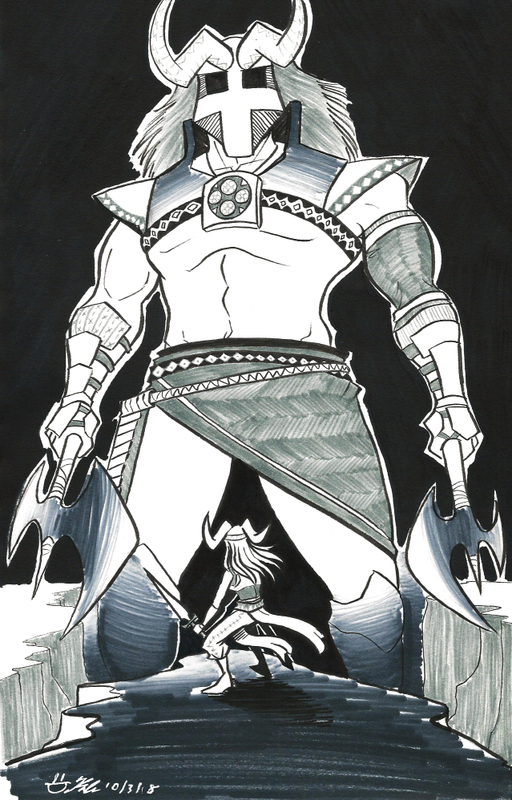 Well, I plan to launch a website dedicated to indie comics. I mean webcomics, small press, independent publishers, and the stuff you can only get at zine fests and comicons directly from the creators themselves. The website will start with comic reviews and interviews. If you’re a regular reader, you may remember two blog post series’ I had running on this site before: Review Day Tuesdays, and Featured Artist Fridays. 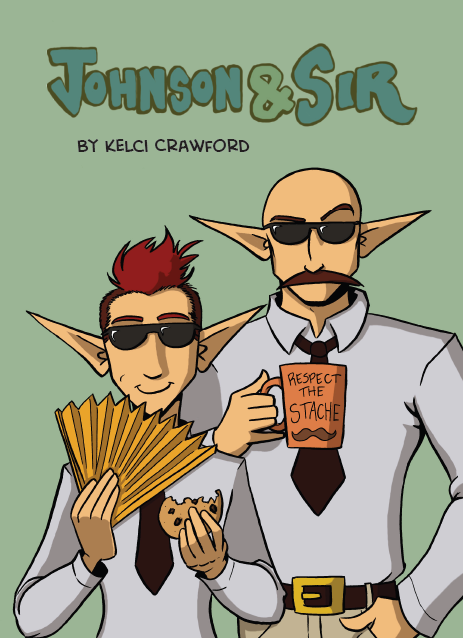 In fact, I did a Feature recently on a webcomic artist. Indie Comics Hub will be a website dedicated to just that. (Plus maybe the occasional Top Ten list, and anything else particular to indie comics). I hope to not only launch this site, but also grow it enough to bring on at least one other contributor. I hope to monetize it enough to actually pay this contributor, as well. But the first achievement to unlock is to make the dang site. It will NOT be an online store. When I did my research, I discovered that there are roughly 6 billion online stores advertising themselves as “the hub to buy indie comics.” Indie Comics Hub will NOT be one of them. This was a goal I had for 2018, but I neglected it. To be honest, I feel like I’ve neglected my Patreon page somewhat. I update it as consistently as I can, but I feel like I can do MORE with it. If you’re not a patron on Patreon yet, why not? If you’re broke, that’s ok, there’s no pressure to pledge. But if you have the funding to pledge and you haven’t yet, I’d like to know why not. Is it Patreon as a system? Or are there rewards that are missing that you haven’t seen me offer yet? Be honest and let me know. I want to improve my Patreon in 2019 and I cannot do that without your feedback. Here’s where I disagree: I took weight training classes in high school. I was actually a weight lifter, believe it or not. My personal record is having bench-pressed 180 pounds. There was one time I did 210, but 180 was what I could bench consistently without straining myself. Both of those weights are more than my own personal body weight. And I miss being able to lift and press things that were heavier than myself. There’s a satisfaction I get in weight lifting that I don’t get in many other forms of exercise. That satisfaction is being able to see the progression and improvement of how much weight I can move. Being able to track that is a big part of why I like weight lifting so much. The problem is: I can’t afford a gym membership at the moment. So the only way I can go to the gym is when my mom brings me along as a guest to Planet Fitness… whenever she decides to go. Or remembers to invite me. However, my buddy and former Dungeons and Dragons player, Dana, was on the lookout for somebody who could tag along with her to the gym. She wants to get in shape, but doesn’t know how the equipment works. (Wee lamb didn’t even know what a bench press was). So the plan right now is, starting in 2019, I’ll be Dana’s plus-one at the gym. I show her how the equipment works and train her a bit, and I get to exercise. Win-win! Yes, I have a yard, but a) it’s tiny, and b) the enormous pine trees cast most of the place in shade for 90% of the day. The only space with consistent sunshine is the front of the house, and… we don’t have a front yard. We have a front sidewalk. However, there’s a big freaking window in my living room that lets in a metric ton of sunlight every dang day. So the plan is to build a shelving unit and start growing some plants there. I like green things, and I like having plants in a space. It’s aesthetically pleasing, cleans the air, and makes a space feel more alive. Also, to be honest, I want to see if I inherited my late grandfather’s green thumb. He grew vegetables all year long thanks to his massive outdoor garden and the greenhouse porch he had built. He was most proud of his tomato plants – he was even buried with the tallest one that he had ever grown. I want to see if I can start something like that. The idea is to start with herbs and succulents – those are often the hardest to kill on accident. Especially basil. Basil is a surprisingly sturdy plant in my experience. I had a basil plant in Phoenix and it was exposed to constant sunlight. That sucker (his name was Nigel) never died. In fact, putting him in the shade was when he seemed sickly. The other cool thing about growing plants indoors: FOOD. I want to be able to literally eat the fruits of this labor. So those are my goals for 2019. 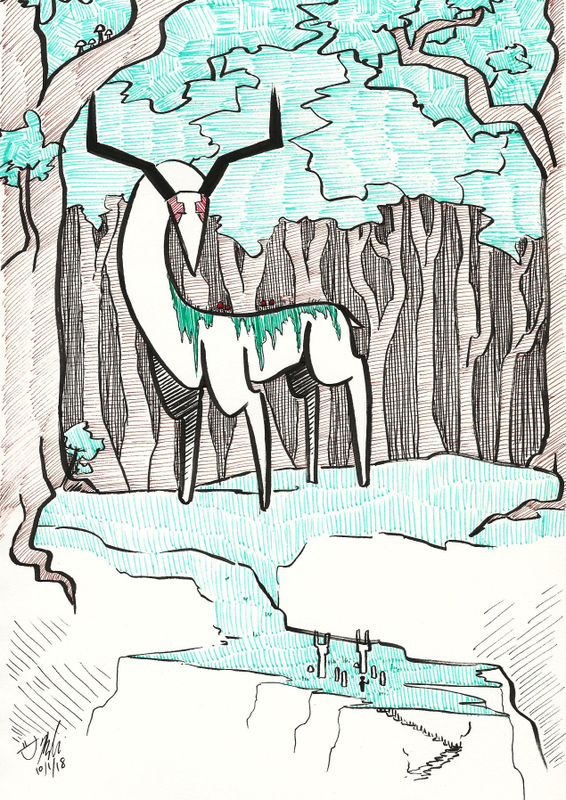 There’s smaller ones, too, like drawing one sketchbook page a day, and writing one page a day. Those are connected to the larger goals for the year. There may be a secret Part 3 of this post series. It would highlight my bullet journal and how I’m going to track all of these goals. But I have to get a bullet journal set up for 2019 first. What are your goals for 2019? Let me know! I’d love to hear about them. Also, we can be accountability buddies – I want you to achieve your goals, too! For a show I was invited to at the last minute, Imaginarium Convention in Louisville, KY was worth going to! 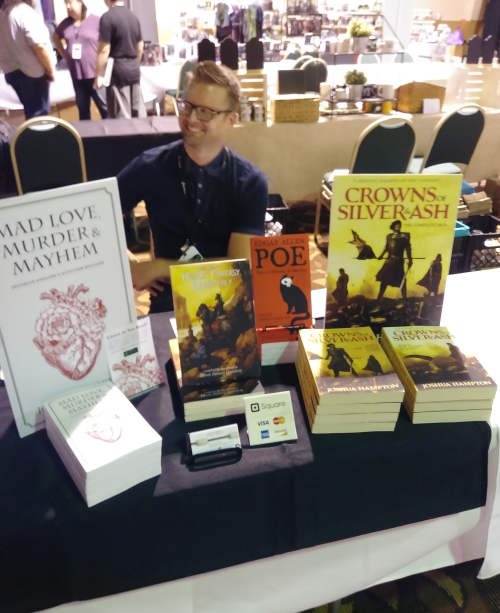 I shared a table with two very cool authors: Neal Sayatovich, writer of dystopian psychological affair, and Joshua Hampton, writer of epic and high fantasy. Neal covered my table fee in exchange for some art (thanks Neal!). The folks at Imaginarium gave me a free pass in exchange for doing panels. 4 panels, to be precise. Holy banana pants did I meet a LOT of cool folks at this show! 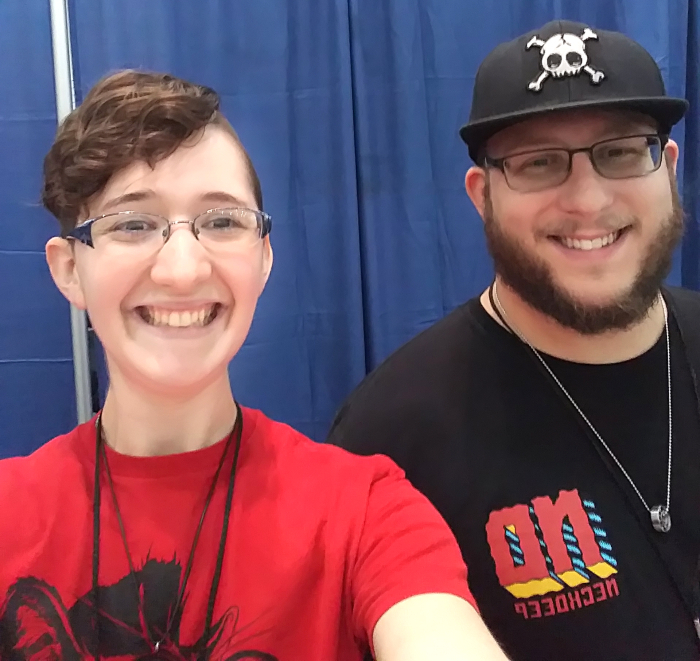 From mermaid/pirate lesbian fiction writer DB Francais to Justin and Cory at Purvis Games, from Glenn Porzig to Mackenzie Flohr, holy jeez were these people super approachable and fun to chat with! Most importantly, I learned a lot. If there is one thing I can commend Imaginarium on, it’s their panels. While it’s kind of silly just how many there were (often having four or more happening in the same time slot), the breadth and depth of topics was hugely commendable. Plus, the panelists themselves knew what they were talking about. One author described the panels as “iron sharpening iron,” and he wasn’t lying. Those were the ones I presented in though. 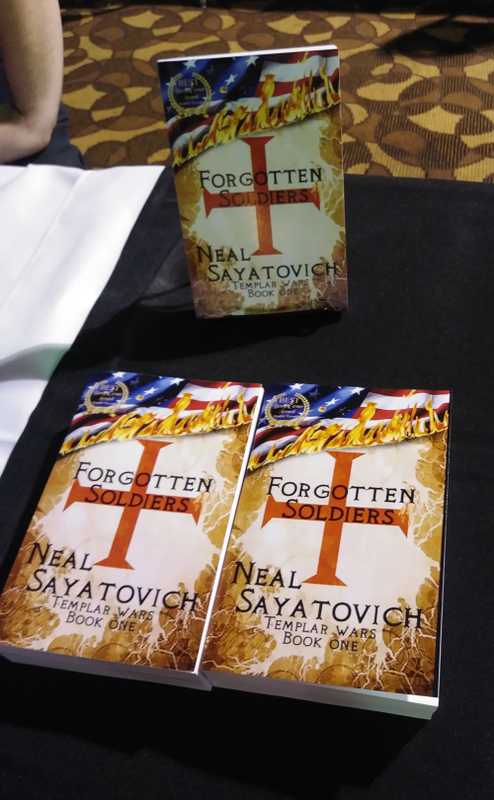 I also attended a panel about Military in Fiction (Neal was in that one), Audiobooks, and Freelance Writing. The Freelance Writing one covered basically what I already knew – but the Audiobooks panel was immensely helpful. Why? 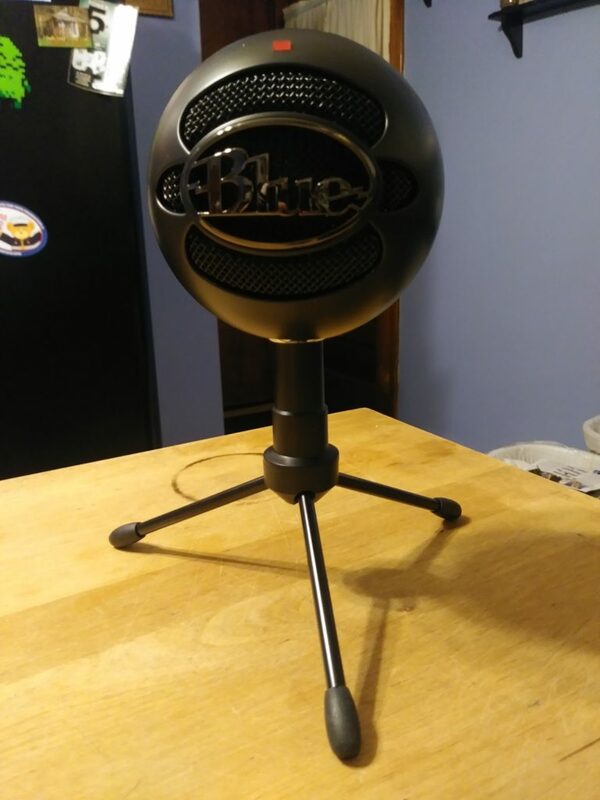 Because I want to get into voice-over and voice-acting. (Yes I’m aware the two are very different.) The Audiobook panel covered a lot, from authors finding and hiring talent and what they look for (always a plus) to knowing how to set up your own DIY recording space. I’m REALLY jazzed about what I learned in these panels. The best thing is: these panels are giving me some new blog post ideas. And with that, I’ll make my temporary leave. Hopefully next time I’ll have a tutorial for you. The organizers at Imaginarium Convention this year have me scheduled to be at 4 panels – holy banana pants! 11:30 am in room Appalacian: LGBTQ Characters in Fiction. Moderated by Janie Franz with panelists Eliot Parker, Amanda Burkhead, Jimmy Misfit, Michele Lee, and me. 9 am in room Appalacian: Healthier Habits for Creatives. Panelist include: Janie Franz (moderator), Angelyn Sherrod, Donna Dull, and me. 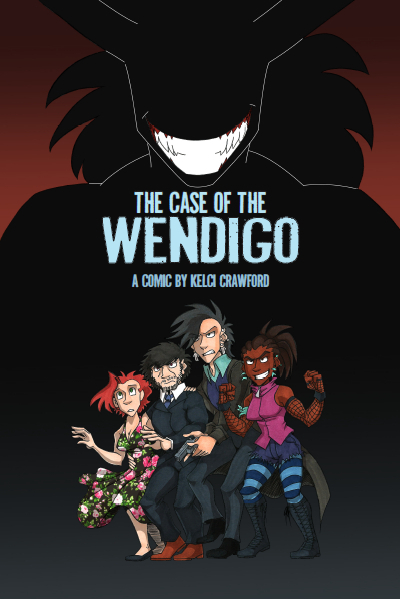 11:30 am in room Burley: Comics and Graphic Novels. Panelist include: Dan Jolley (moderator), S.C. Houff, Michele Lee, John Risner, Sean Dulaney, Glenn Porzig, and me. 2 pm in room Heartland: Composing Newsletters with Mail Chimp and Beyond. This will be a 2hr panel. Panelist include: Sandy Lender(moderator), Addie King, Eric Shawn Moser, Megan McIntosh, and me. For more details about the panels themselves, or to check the full (absolutely bonkers and lengthy) listing, check this link. I’ll ask the event organizers if I can stream any of these panels for you to see. If I’m allowed, the panels may be streamed onto Facebook. Keep an eye on the Facebook page for further announcements on this. If you’re unable to attend Imaginarium, then please check out these two new things my awesome friends released! 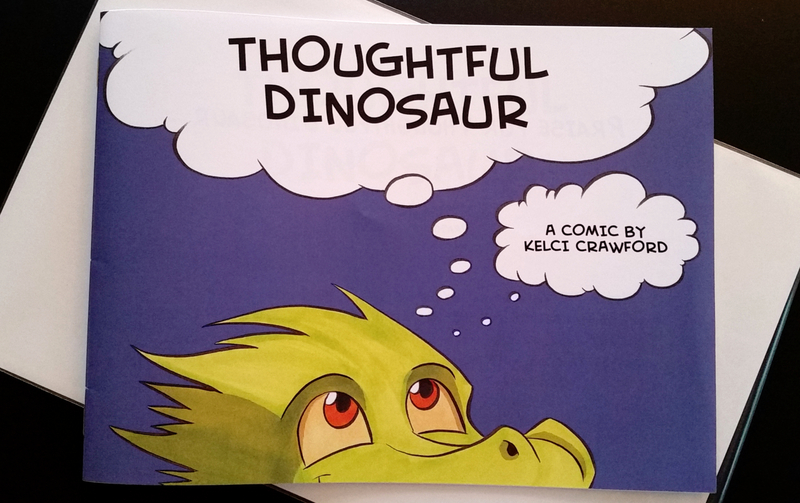 First, My friend Suzy Anderson has launched a KickStarter campaign! 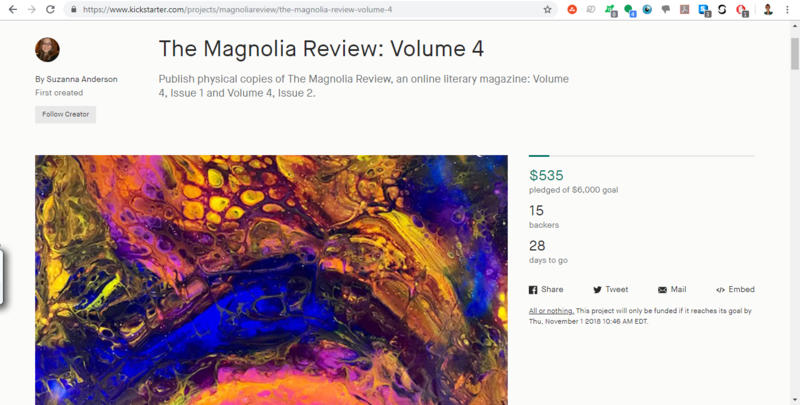 See, she runs this independent art and literature magazine called The Magnolia Review, and it’s on KickStarter right now to get funding for Volume 4, Issues 1 AND 2. Rewards include copies of the magazine, postcards, bookmarks, and other goodies! 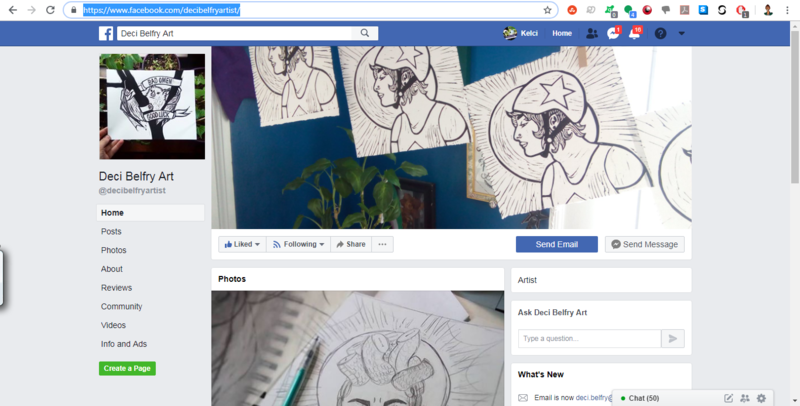 Second, my friend Deci Belfry just launched their Facebook page to share (and sell) lithography prints, watercolors, and other art they make! Seriously, check out their printmaking portfolio. It’s gorgeous stuff! They also have a catalog of their work, and they do something called sliding-scale pricing. Be sure to check out the Facebook page for more. Ok, here’s the deal: I’ll be taking the Storenvy shop down very soon. As in, closing its doors. Why? Because I want to build my own online store for my website, instead of having it under the Storenvy name. Don’t get me wrong, I loved working with Storenvy! They were certainly more agreeable than most online stores (ahemEtsyandRedBubbleahem). However, I’ve kind of outgrown Storenvy – they’re starting to ask for subscriptions out of me in order to do things like email abandoned carts, offer discounts, and have my own domain. Just looking at the math, it would be easier and cheaper for me to host my own dang store. From today until SEPT 30, buy anything from the store, and get a free piece of original art from my bin included in your package! This is a $10 to $30 value – free with your purchase. But ONLY UNTIL SEPT 30. Click here to jump on it. That’s all for now. Thank you for your support! 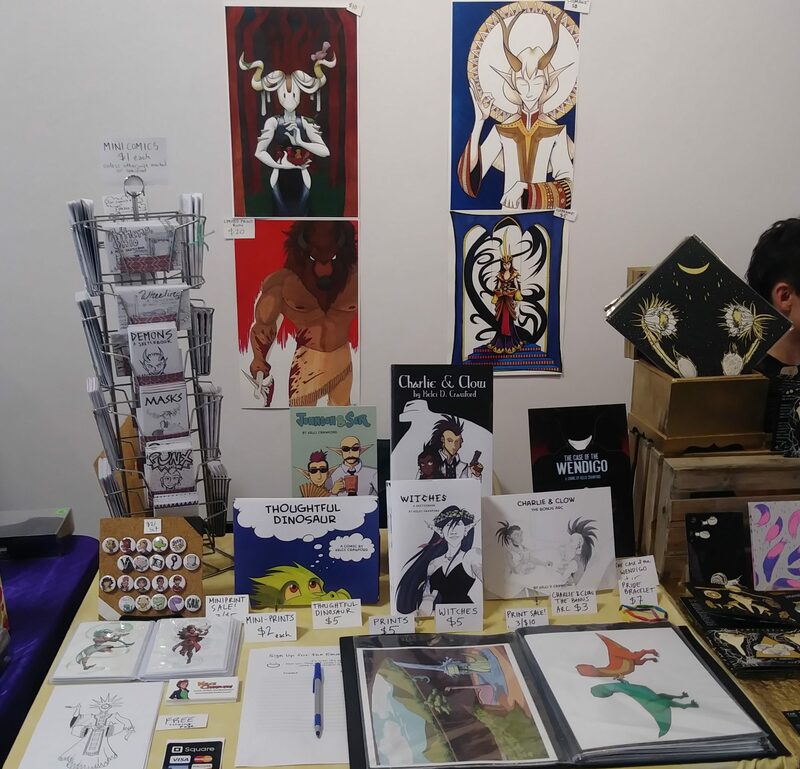 Comicon Erie – ROUND 2! 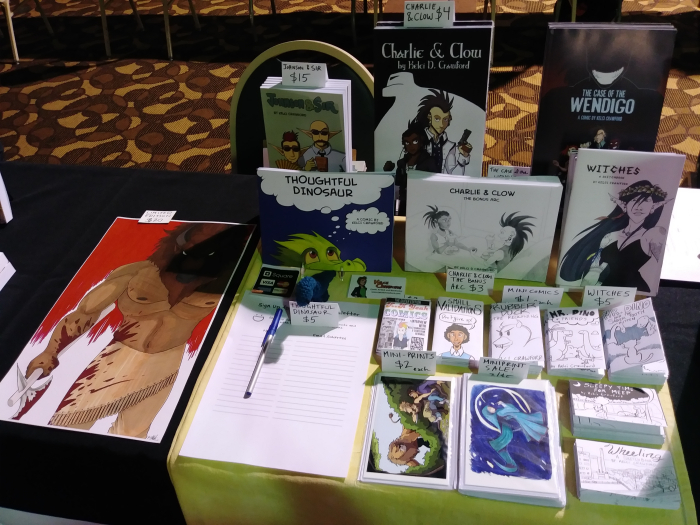 I returned once again to Comicon Erie, and was surprised by a couple of things this year. First, I brought a table buddy this year. This is Mack. While not an artist, he helped a lot with carrying my gear in, setting up the table, and tracking sales. I brought him with me because last year’s Comicon Erie was ABSOLUTELY PACKED on Saturday. People had a hard time moving up and down the aisle, even with the ample amount of space given. Sunday had more attendees this year than last year. Plus there were some vendors and artists who said they did better sales on Sunday than on the previous two days. That makes sense, since there are some con goers who wait until the end, after scoping everything out, to go back to the artists and vendors they liked. But this year, I’ll be honest, I was expecting more out of Comicon Erie than what was there. I don’t know if there was another event happening at the same time, but attendance was not what I expected it to be. And that affected my sales. I earned less this year compared to last year. This year the convention was asking for a larger deposit than what they asked for last year. But look – I did so well last year I decided to reserve the spot and come back this year. But this year actually earned me less in sales. And now the center wants a LARGER deposit out of me? What if sales just keep going down every year and the deposit gets increasingly larger and larger? I’m not interested. Plus, it’s not cheap for me to go to this con- I’m not local. So I would have to pay for hotel (or at least an AirBnB), food, the convention floor spot, and gas to get there. Also, chairs were not provided with the table this year. Somehow I missed that detail on the application, but I thought that (like MOST OTHER comic conventions), chairs would be provided with your table space. But not here! So, Comicon Erie, I love you, but I won’t be going back next year. That said, I saw some posts from folks I follow on Instagram – turns out, there WAS a convention happening the same weekend, but in Maryland. Small Press Expo (or SPX). I’ve always wanted to go to this show, so I plan on going to SPX in lieu of Comicon Erie next year. I hear that SPX is harder to get into, though. So I’ll have to do my best!